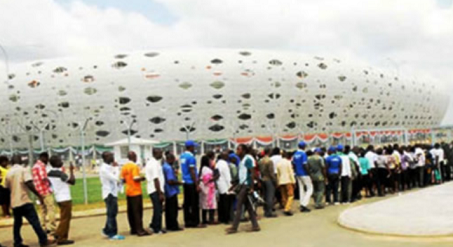 Five people were feared dead while scores sustained serious injuries on Saturday following a stampede at the entrance of Godswill Akpabio International Stadium in Uyo, the Akwa Ibom State capital. The incident occurred while football enthusiasts tried to enter the stadium. The fans, who were at the stadium to watch a match between the Super Eagles of Nigeria and the Chipolopo of Zambia were allegedly beaten by soldiers at the gates of the stadium with heavy sticks. The stampede occurred as the crowd tried to avoid the soldiers’ sticks. The bloodstains were around the gate of the stadium. Policemen and personnel of the Federal Road Safety Corps were seen standing beside some unconscious fans. A Punch correspondent, who lost N10,000 in the stampede, was also assaulted by one of the soldiers with a big stick. Some of the fans who spoke with Punch correspondent and vowed never to go to the stadium again, said they escaped death by the whiskers. A female fan, Aniema Ekong, said “I thank God that I’m alive. This is not the first time this kind of incident had occurred. In fact, in every major tournament, there is always a tale of woes to tell about security agents injuring or killing people. The state Police Public Relations Officer, Elkana Bala, initially told Punch correspondent that he would find out what actually caused the stampede.